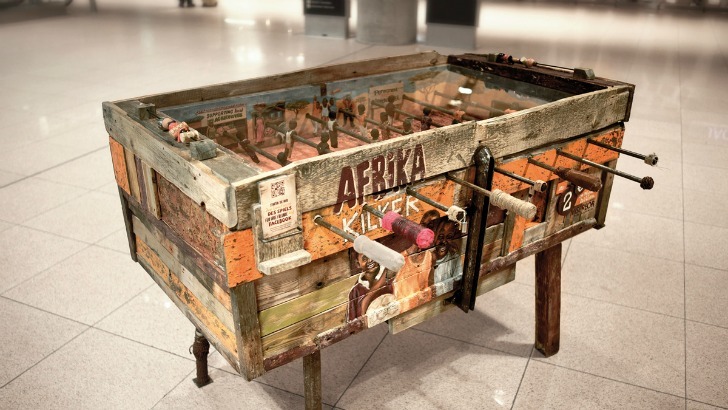 This fantastic wooden Foosball table, Afrika Kicker, is a socially-motivated, mobile concept that raises money to help support youth activities in South Africa and Rwanda. Created by Misereor, the table is entirely different from its commercial equivalents, made up of pieces that resemble the playing fields scattered across rural areas of Africa. The design includes many of the typical elements you might see on a rural ‘pitch’, including a sandy and uneven ground, a tree, and a well in the middle—some of the players even play on crutches! Moreover, for every game played, 2 Euros is raised for the kids. Bringing technology into the mix, the game integrates a small camera that records the game and streams it live on the internet. Players can then harness the power of their social networks to promote not only their game, but the social objectives of the design concept. Friends and family of players are not only able to follow games as they happen, but they can donate quickly and easily online. 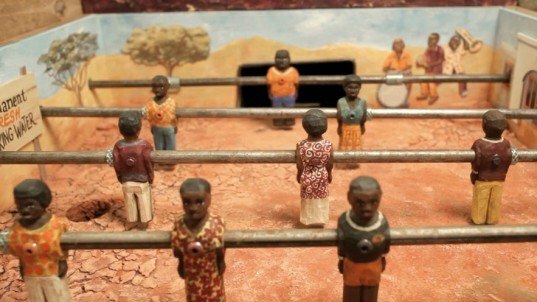 This fantastic wooden foosball table, Afrika Kicker, is a socially motivated mobile concept that raises money to promote children and youth in South Africa and Rwanda. The table is toured all over the place for a wide variety of players to enjoy, and collects up donations of 2 Euros per game. Created by Misereor, the table is entirely different to its commercial equivalents, made up of pieces that resemble playing fields scattered across rural areas of Africa.